Focusrite make their first foray into the 500-series format with a preamp — but is it worthy of the revered 'Red' name? Next year will see the 25th anniversary of Focusrite Audio Engineering Ltd, and it's quite fitting that the instantly recognisable Red series should make a comeback as part of the company's celebrations. The Red series was the first progeny of Focusrite's new direction after the Studio Console (see box), and comprised a range of rack-mount preamps, EQs, compressors and channel strips. These were distinguished by thick, bright-red, anodised aluminium front panels, and the circuitry was derived directly from the original ISA module designs. 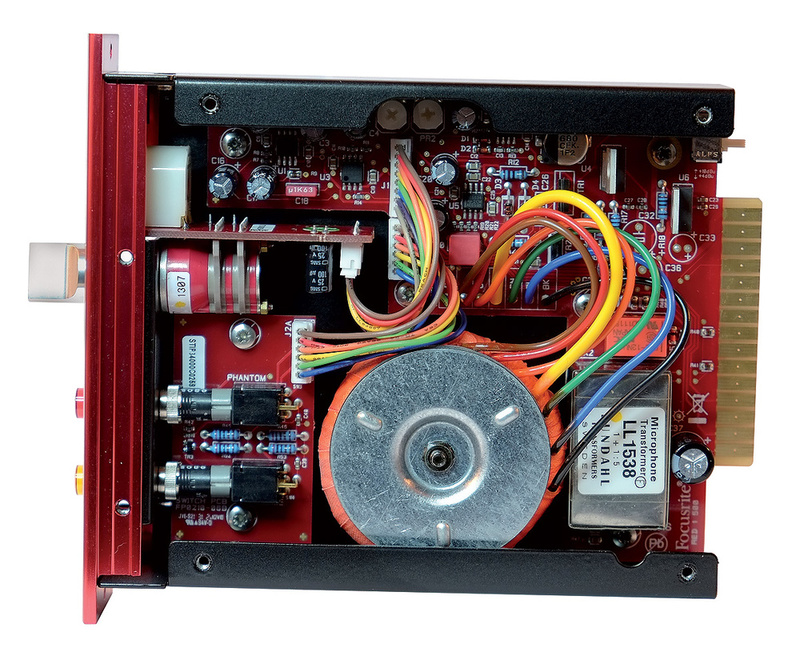 The Red 1 quad and Red 8 dual preamps employed input and output transformers with NE5534 op-amps, in a surprisingly simple, but extremely competent, design. The new Red 1 500-series module reviewed here is a direct descendant of the original Red 1, and its styling cues point straight back to that antecedent. In fact, the Red 1 500 is a perfect recreation of the Red 1 design, sharing the same circuitry, the same transformers, the same facilities, and the same anodised front panel, albeit in rather thinner-gauge aluminium this time! In fact, the only thing missing, as far as I can see, is the 'scribble circle', and that's only because there isn't the space. The Red 1 500 ships with a simple 12-page manual, a registration card (which also accesses a free download of Focusrite's Midnight Suite plug-in), two Allen bolts and two Allen keys. The stainless steel bolts and one of the Allen keys are provided for securing the module in a rack. The other key is to tighten the gain switch knob, should it work loose. The module is entirely enclosed in a black painted-steel case (a sensible precaution, with input and output transformers on board), and the rear panel carries the standard edge connector and a small slide switch, which inserts a 6dB pad in the meter circuit. By default the 0VU mark corresponds to an output level of +4dBu, but sliding the switch up shifts the reference to +10dBu. This helps those who like to work with less headroom, reducing the amount of time the meter needle is pinned to the end stop! The mic input and line output connections are, of course, provided by the host 500-series chassis. The front panel is very simple, but all the more elegant and attractive for it. The number '1' is milled into the top right-hand corner, above the circular, illuminated VU meter. Below this, a rotary gain switch increments in 6dB steps from -6 to +60 dB. There's no fine trim control, but in tests the gain was within 0.5dB of the markings in most cases. The minimum input level for a +4dBu output (gain at maximum) is -56dBu, which could be delivered by a capacitor mic of 20mV/Pa sensitivity exposed to just 70dB SPL, or a 2mV/Pa dynamic mic in 90dB SPL. At minimum gain (-6dB) an input level of +11dBu is required to produce an output of +4dBu. Standard +48V phantom power is actuated by an illuminated red push button, while the output polarity can be inverted with an illuminated yellow push button. And that's it; there's no instrument input, no gain trim, no high-pass filter and no limiter. 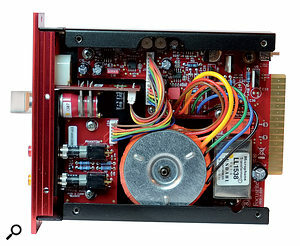 The Red 1 is a basic, no-frills, but high-quality, preamp. The Lundahl 1538 transformer has been used in Focusrite's high-end preamps since the early ISA110 modules. As with the ISA110 before it, the Red 1 design is remarkably simple, and starts with a Lundahl 1538 input transformer, which is wired with parallel primaries to give a 1:5 turns ratio. This provides 14dB of 'free voltage gain', reducing the demands placed on the active gain stages considerably. The 1538 transformer has been a constant element in Focusrite's high-end preamps from the earliest ISA110 modules, through all the Red and modern ISA implementations. I was fortunate enough to have the opportunity to visit the family-owned Lundahl factory in Sweden recently, and was hugely impressed with the quality and attention to detail I observed in the way its remarkably wide range of audio (and digital) transformers are designed, built and tested. The first gain stage is based around a single NE5534 op-amp and the 12-position gain switch, which is arranged to do two jobs simultaneously. The bottom six positions provide a reducing amount of input attenuation of the input transformer's output signal. The top six positions gradually reduce the gain stage's negative feedback, thus increasing the overall gain. This clever arrangement maintains the circuit's internal headroom margin for all gain settings. (Similar ideas can be found in other Rupert Neve designs and those of contemporary console designers.) The second gain stage comprises another NE5534 coupled to a very simple Class-B output stage, built from discrete transistors, and provides a fixed amount of gain. The transistors relieve the op-amp from having to deliver high currents into the output transformer and, as they're included in the negative feedback loop, any non-linearity or distortion is automatically corrected. The toroidal output transformer has two secondary windings, one delivering the balanced output, and the other contributing to the feedback loop of the output gain stage. This ensures that any transformer distortions are also corrected, explaining why it's virtually impossible to drive the output into saturation. The Red Series was often noted — or criticised — for sounding clean right up to clipping, and this definitely isn't a preamp that you can 'drive' to achieve saturation effects! A couple of JRC NJM4565 op-amps generate the metering signal and drive the VU meter itself, while local voltage regulators ensure clean and stable power rails for the audio circuitry. The Red 1 500 is very well engineered, with excellent specifications throughout. The output clips at +25dBu, so there's no problem driving high-end converters aligned with 0dBFS = +24dBu, and the input can tolerate levels of over +28dBu, apparently! The input impedance is a relatively low 1.1kΩ for all gain settings below 24dB, reducing to 1kΩ for gain settings above that. The bandwidth extends from 30Hz to well over 80kHz (-3dB points), with a fixed 6dB/octave roll-off at the bottom end. At the top end, a very gentle dip is evident above 10kHz (reaching -0.4dB at 20kHz and -1dB at 40kHz). The input transformer appears to have a well-controlled resonant peak (+0.4dB at 75kHz), followed by a fairly steep HF roll-off. Loading the output with a 600Ω termination (as opposed to a high-impedance load) reduces the output level by no more than 0.25dB, and has a negligible effect on the frequency response. The Red1 frequency response shown with an extended frequency scale to reveal the well-controlled LF roll off, high-end transformer resonance. 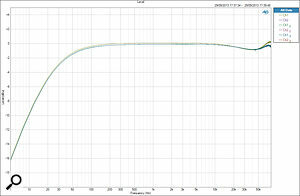 The lower, darker trace is with a 600 ohm termination, with the upper trace is with a high-impedance load. I calculated the Effective Input Noise (EIN) at -131dBu A-weighted, which is better than the published figure of -128dBu, and the THD+N figure measured 0.07 percent, with 60dB gain delivering a +4dBu output level. 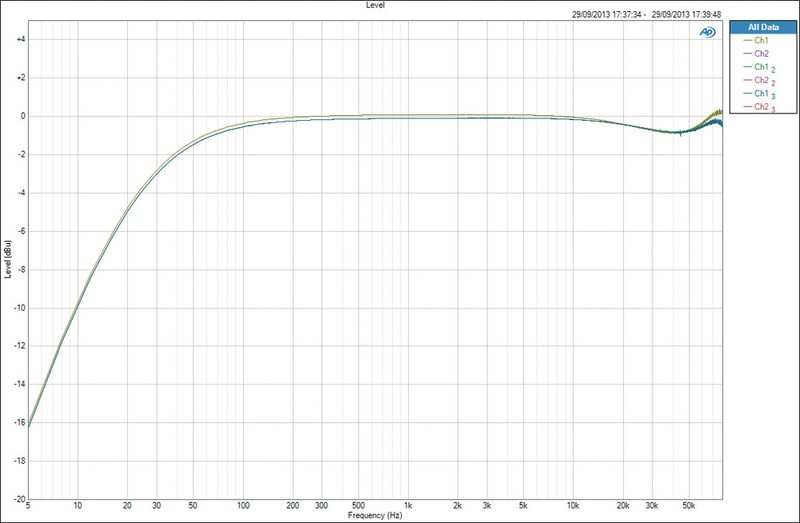 With 30dB gain and a 0dBu output, the bench test matched the published figure of 0.003 percent. Harmonic distribution was predominantly even-order, with strong 2nd, 4th and 6th harmonic components. I liked the original Red 1 preamp a lot. It always struck me as a sensible, well-engineered design that just got on with the job. It was clean and quiet, with adequate gain, generous headroom and an essentially neutral and transparent sound character, albeit with a very mild hint of lower-mid richness. The new Red 1 500-series has retained those positive characteristics precisely as I remember them, and for anyone who wants a classy, solidly built neutral preamp, this is a very strong candidate. However, it's not a preamp that can be 'pushed' to add character, despite containing transformers at both ends of the signal path. The sound really doesn't change much as you build the source level or gain until you reach clipping (which isn't a nice sound). There aren't any additional facilities either — there's no instrument input or adjustable HPF, for example — which makes the asking price appear rather optimistic. The bottom line is that this is a lovely-sounding, essentially neutral, preamp, with high-end polish and build quality, but it faces very strong competition at this price. I hope Focusrite will give the Red EQ and compressor the 500-series makeover because I suspect they'd prove more popular. There's enormous competition amongst 500-series modules, and a lot of excellent low-cost options. The Red 1 seems to have been priced to compete with standards such as API's 512C, and Neve's 1073LB and 88RLB. These all have instrument inputs, which the Red1 lacks, and the latest, more affordable, Rupert Neve design, the Portico 517, includes a compressor as well as mic/DI blending facilities. Focusrite were originally founded by Rupert Neve, after he sold his eponymously named company, to build modern retrofit input modules specifically for Sir George Martin's vintage Neve console at his Air Montserrat studios. The resulting ISA110 module combined mic and line input stages with a four-band EQ, broadly replicating the functionality of the Neve 1073/1084 modules. It was probably inevitable that pressure would build to develop other system modules and, eventually, an entire console. The stunning Forté console was the outcome, but only two were made before the company fell over, and Phil Dudderidge, having sold his interest in Soundcraft, subsequently acquired the assets and formed a new company, Focusrite Audio Engineering. This new company continued to make and sell the original ISA modules, while simultaneously working out how to redesign the console to make it affordable to build and sell! The Focusrite Studio Console shared the Forte's ethos, style and basic modules, but was a little simpler and much more cost-effective. The waning interest in analogue technology at the time meant that only 10 Studio Consoles were built, seven of which survive today. Dudderidge likes to say that Focusrite was the last manufacturer to start building high-end analogue consoles, and the first to get out! The original, classic ISA preamp design in a 500-series module. Lundahl input and Carnhill output transformers. Beautiful styling and elegant simplicity. Excellent technical performance and good headroom. An essentially neutral sound character. Lack of instrument input makes this a little expensive. 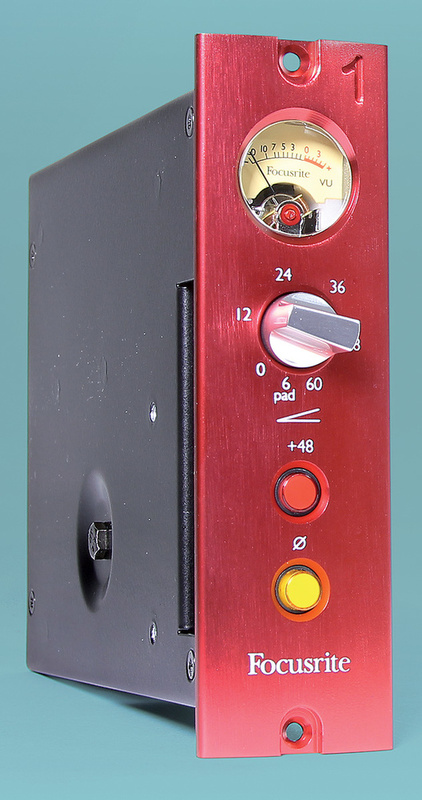 The Red 1 500 is a perfect reincarnation of the original Red 1 preamp design, and it translates well into the Lunchbox format. The elegant design is very clean and transparent, with the quality and grandeur expected of a high-end preamp, but it doesn't lend itself to being pushed for flavour. Focusrite US +1 310 322 5500.